Today I went to the Alice Project sale. A lot of hairs are 50% off, which makes them about L$175 each. Now some of you might not have shopped at the Alice Project before, and may need some help with the HUD’s and everything. I’m saying this because I very much remember the first time I went shopping there, and I was very, very confused. Now you can of course buy one of the L$500 HUD’s with various pretty haircolours (which work with every hair) but you will already get a mini HUD with each hair you buy. So just go there, click on the hairs, DEMO and buy! Villena released some very cute suspender shorts-things just today and they are SO cute! You can wear it with or without the croptop that comes with it, and if you wear it with it you can change the colour and pattern on them! An example of the HUD you get with it you can find right here. Also… aren’t you curious where that first hair is from!? I sure am! ALSO this! We all know that Hair Fair 2013 is slowly nearing, and we all know that this fair is especially organized for the charity Wigs For Kids. Bandana day is a part of this! This year they have their very own mesh bandana which comes with a UV map so it can easily be textured – and you can make yourself one! Just contact Sasy Scarborough, as it says on the picture above, and at the end you’ll send them back to CharitySasy String. 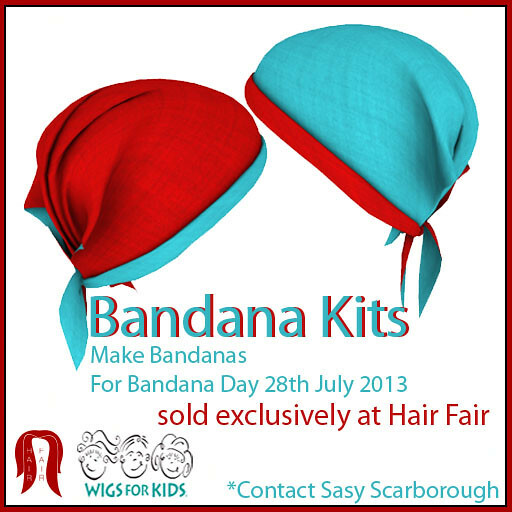 Read more about this @ Hair Fair’s blog and their post about bandana day. Villena has some really cute glasses @ SL Fashion Week this week, at a discounted price, and with a color HUD! Lamb came out with 3 new hairstyles, which look alot alike, but I’ve seen all three of them of different people. Which just shows that there is something for everyone, even when it comes to the haircolors! I’m totally in love with these SLink hand appliers for League, yaaay. Another post, and this time I’m rocking some cargo shorts from *Ninia*. It’s a great store, I love every single thing that there is – but right now, theres only a marketplace store! You should definitely browse it for a few seconds and have a look, because I adored it and I do also love these shorts. I also dug up these headphones from Standby Inc. from one of the earlier The Arcade rounds because I just remembered today, or more so: I was told, that the upcoming round of The Arcade is in only three weeks!